The key to making awesome smothered burritos is tender, shredded beef and a thick, flavorful sauce. It might not look too photo-worthy, it is hard to resist eating all of the beef straight from the slow cooker before it ever makes it to a tortilla. 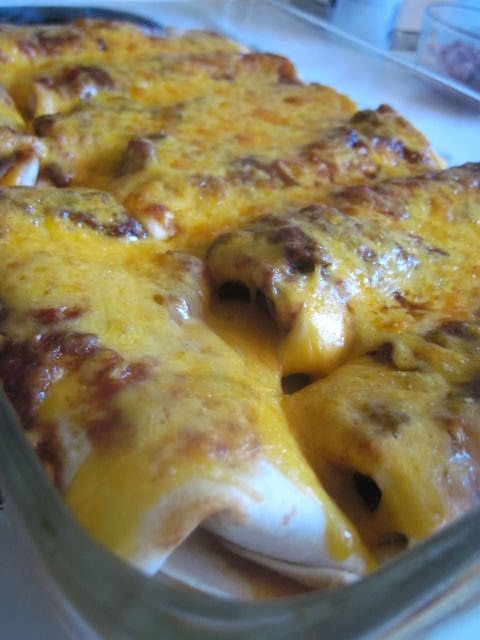 This recipe is very slightly adapted from The Food Pusher’s Chile Colorado Burrito’s. I have had a huge hankering for shredded beef burritos, so I decided to do a little Pinterest shopping. As I was scrolling through Pinterest’s burrito section…… WARNING, do not scroll through the food section when you are hungry, it’s just plain torture, have a snack first. 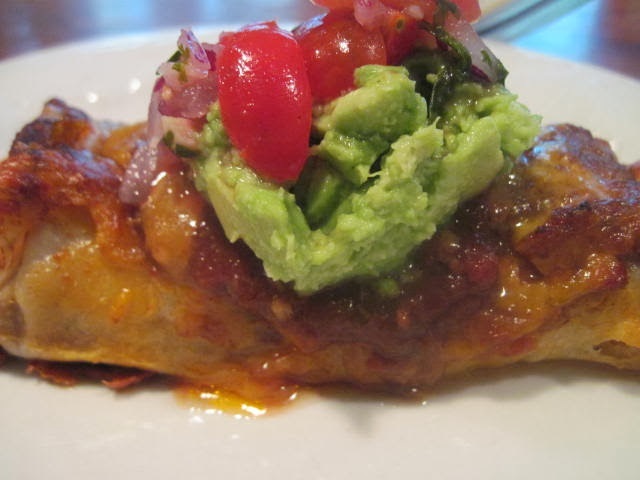 I came across a delicious photo of a Chile Colorado Burrito. I had to go check it out. First of all, the recipe calls for bouillon cubes, I never have these on hand, too salty for my taste and it also calls for enchilada sauce. Since I didn’t have that on hand, I made my own sauce recipe, much better, with so much more flavor. So, as I am drooling looking at this smothered burrito, I am just imagining all of the possibilities, oh yes, homemade guacamole, homemade salsa, lots of cilantro. The key to making awesome smothered burritos is tender, shredded beef and a thick, flavorful sauce. It might not look too photo worthy, it is hard to resist eating all of the beef straight from the pot before it ever makes it to a tortilla. Usually, the shredded beef burritos that I have ordered in Mexican restaurants turn out to be overcooked and flavorless. But these beefy babies are so flavorful, they just melt in your mouth goodness. Use a chuck roast or an inexpensive cut of beef, this is the best bet for your crockpot meal. Add your favorite toppings for an incredible meal, invite your friends over, they will love you FOREVER! 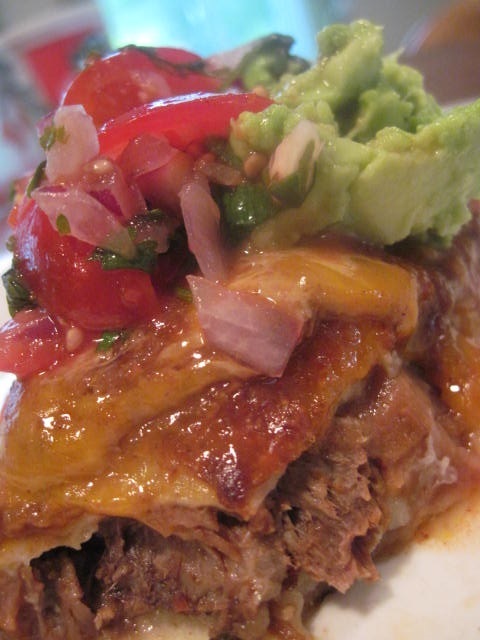 The key to making awesome smothered burritos is tender, shredded beef and a thick, flavorful sauce. It might not look too great, but it is hard to resist eating all of the beef straight from the pot before it ever makes it to a tortilla. Put beef ( I cut up the beef into four sections), seasonings, chiles, and tomatoes into a crockpot and cook on low for 7-8 hours, or until meat is very tender. (Can also cook on high for maybe 3-4 hours.) I've also cooked it in a dutch oven for about 4 hours at 325 degrees. More meat, more time. A third option is to cook it in a large heavy saucepan--bring it to a boil on high heat, reduce heat to low, cover, and simmer for 1½ to 2 hours, or until the meat is tender. If you go with a method other than the crock pot, make sure the pot is covered and pretty well sealed to minimize evaporation of the liquid. When beef is done (very tender and flakes off when stirred), taste and add salt, if desired. Heat up refried beans in the microwave (covered and in a microwave-proof dish, of course) and put your oven on broil. On an oven-proof plate, or cookie sheet even lay out a tortilla. Place on tortilla about ½ cup of the meat, drained by using a slotted spoon, and a spoonful or two of beans. Roll into a burrito (hopefully, you know how to roll these). Pour some of the remaining sauce from the crockpot over the burrito to cover it. Sprinkle with some cheddar cheese. Broil until cheese is bubbly, about 2-4 minutes. Add whatever you like on top of your burrito. Salsa, guacamole, sour cream, hot sauce, cilantro~go for it! Makes 5-7 burritos, depending on how full you make them. Let us know if you make this cake! Use #Mooreorlesscooking.com when you share your photos on social media. This is a great way to use up leftover pot roast. My kids never want to have it a second night. Now they will and won’t know it! I am with you on this one Michelle, my kids are the same way with left overs! Score 1 for Mom! O MY GOODNESS….. thanks for a wonderful recipe!! just made this recipe today and everytime i walked in the house i kept saying “that smells so good” very easy to recipe to follow and taste amazing. this is a keeper! It is the 28-Ounce Can. I will update that in the measurements.